Sen. King is the only Maine federal legislator to indicate, even by implication, opposition to any LNG terminal activity in Passamaquoddy Bay. Sen. Collins supports LNG terminals in the state. Rep. Michaud has repeatedly refused to provide his opinion when we've asked on numerous occasions. 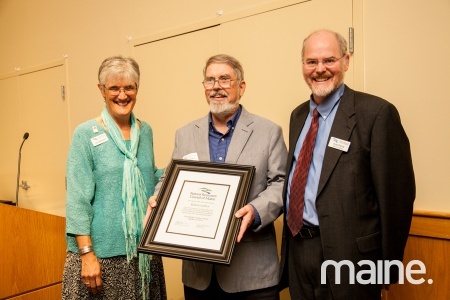 pipeline expansion to Maine, Bangor Daily News, 2014 Nov 25.
and NRCM Board Vice President Fred Pierce. Good authority indicates that Downeast LNG's publicist is now Dianna Graettinger. Ms. Graettinger was a Washington County Bangor Daily News reporter from the onset of LNG proposals in Passamaquoddy Bay (2004). She retired from the newspaper on 2009 June 25. Here we go again, from the beginning! FERC previously indicated that federal agencies have 90 days after release of a Final EIS to make a permitting decision; however, FERC was not referring to itself, but to other agencies. There is no FERC permitting decision deadline. Therefore, the Commissioners could take a year or more to make a permitting decision. Downeast LNG finally realizes their project is doomed, so what do they do? They start over with a new doomed project! Downeast LNG is about to fail FERC permitting, so they're starting over with a "new" project. Dean Girdis and company apparently still cannot wrap their minds around the fact that they've selected an eminently-inappropriate location. They could relocate — as they have been advised since 2006 — but Girdis would have to admit he made a mistake! Besides, since he can sucker his venture capitalists into repeatedly resuscitating his ill-concieved project, he continues to get paid! Project viability has nothing to do with it. It has taken on an undead life of its own — with zombie payments going to Dean Girdis's bank account! 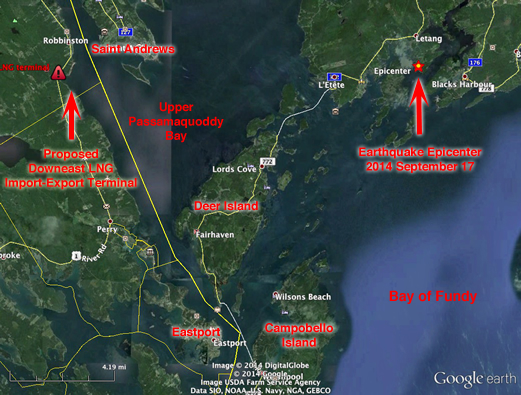 Downeast LNG's proposed LNG import terminal. due to lack of markets for its LNG-source natural gas. Does Downeast LNG president Dean Girdis feel foolish yet? An incident that LNG industry proponents want you to believe cannot happen JUST HAPPENED! LNG Liquefaction & Export Terminals Have Been Constructed. The US is swimming in natural gas. 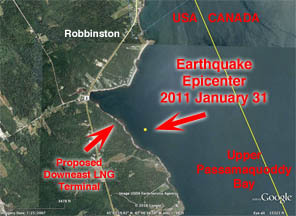 Downeast LNG is unneeded. Source: Email <ngreports@hq.doe.gov> from Office of Fossil Energy, Office of Oil and Gas Global Security and Supply, Division of Natural Gas Regulatory Activities, US Department of Energy.